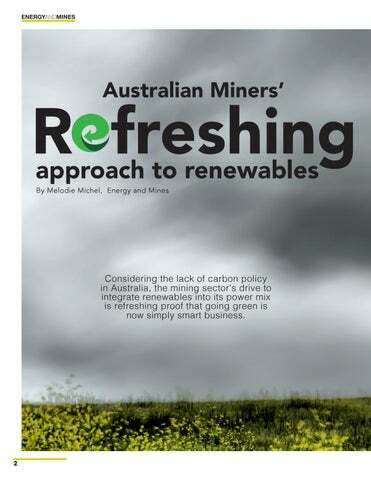 Considering the lack of carbon policy in Australia, the mining sectorâ&#x20AC;&#x2122;s drive to integrate renewables into its power mix is refreshing proof that going green is now simply smart business. “I don’t think there would be any developer considering a substantial new building, subdivision or industrial estate in Australia who is not thinking about putting some renewable energy into their site” Matt Bowen, Partner, Energy and Regulation Practice Jackson McDonald. various things that lets them do,” says Matt Bowen, Partner in the Energy and Regulation Practice of Jackson McDonald. lian Vanadium Limited puts it, “a very helpful side effect”. “If you were going to propose that to an engineer or designer, there’s the extra benefit of carbon footprint reduction and road transportation; those two things are critical. If you reduce the diesel requirement by 30%, then obviously you are reducing the road traffic to supply that energy by 30% because all of that diesel is brought in by road,” he adds. electric vehicle market is developing: it encourages companies to set up new mines, but is also making better, cheaper batteries available to them. There’s a very interesting circular economy going on here,” says Currie. ELECTIONS AND EXPECTATIONS What is so unique about Australian industry’s tremendous investment in renewables is that it had nothing to do with regulatory requirements - in fact, Australia is surprisingly behind other developed economies when it comes to legislating for climate change. “Australia’s climate and energy policy at a federal level has been the subject of terrible political controversy for the last decade - it’s caused the demise of five prime ministers - and we’ve been unable to get a coherent national policy; there’s a complete vacuum at the federal level,” explains Bowen at Jackson MacDonald. off the ground in recent years. Meanwhile, state governments have taken it into their own hands to legislate on the issue. Tasmania and the Australian Capital Territory have a 100% renewable energy target set for 2022 and 2020 respectively. Queensland and the Northern Territory have fixed an objective of 50% renewables by 2030, while Victoria aims to reach 40% by 2025. South Australia doesn’t have an official energy target, but is on track to reach 73% renewables by 2020. New South Wales and Western Australia are lagging behind in terms of targets, but both are seeing a strong pipeline of renewable projects, and Western Australia has come up with an ambitious roadmap for renewable hydrogen development. point. And while the country’s manufacturing base is currently small, it could grow significantly once powered by cheap green energy. “When we started on this journey around small-scale mines to take them off diesel, it was just the very beginning of what I believe will rival what’s going on in Norway, where we’ve seen the large energy users swap to wind, or Iceland, where people bring their manufacturing because of hydro and geothermal resources - that’s what I think is the future,” says Currie. Judging by mining giants BHP and Fortescue Metals’ forays into hydrogen technology, as well as the Labour opposition’s campaign promise to dedicate A$1bn to its development, it seems obvious that hydrogen will play a key role in Australia’s green future. In fact, the groundbreaking coal-to-hydrogen pilot project that just received a green light from the Environmental Protection Agency in the Latrobe Valley signals a willingness to move past the R&D phase. The project aims to transform 160 tonnes of brown coal into three tonnes of hydrogen over the course of a year, to then ship it to Japan via a specially-designed boat. This kind of innovation may well reconcile Australia’s coal interests and environmental future for good. An aerial view of the Tuvatu plant site with bulk earthworks construction underway. Image credit: Lion One Metals. Mann says. “And hopefully, the power plant will help other groups in the community in the long term.” It’s not the first time that people from these two companies have worked together. A local meeco agent had previously done some consulting work for Lion One. 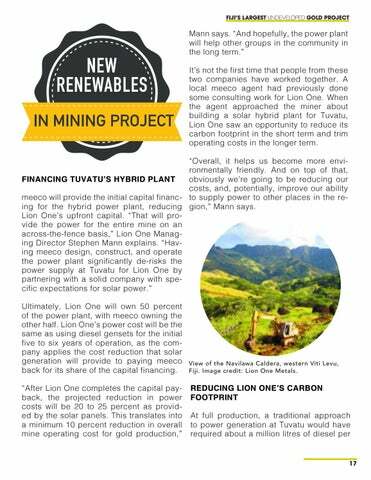 When the agent approached the miner about building a solar hybrid plant for Tuvatu, Lion One saw an opportunity to reduce its carbon footprint in the short term and trim operating costs in the longer term. View of the Navilawa Caldera, western Viti Levu, Fiji. Image credit: Lion One Metals. 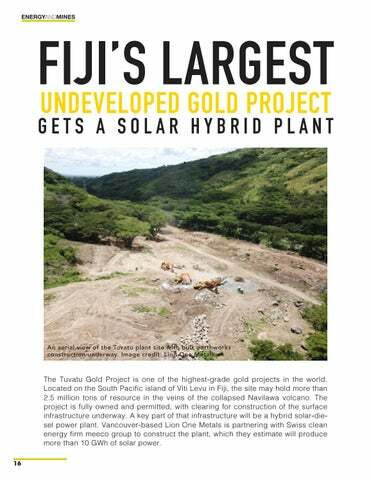 years before the infrastructure is in place and the mine begins to produce gold. 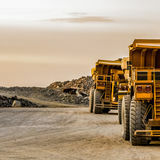 Lion One is currently nearing contract awards for its prime mining contractor, equipment suppliers, and EPC contractor. Tuvatu project location and license areas. Image credit: Lion One Metals. In the meantime, the company is exploring the surrounding geology. Its exploration licenses cover the entire Navilawa volcano. The process facility will be ready to handle the throughput. Designed to run aroundthe-clock, it has been upgraded to produce 1,000 tonnes per day, or over 320,000 tonnes per year. Ultimately, Lion One aims to build production of 100,000 oz. of gold per year at the site over ten years. Australian electricity prices more than doubled in the past decade, leaving energy consumers of all sizes to demand cheaper alternatives from their providers. 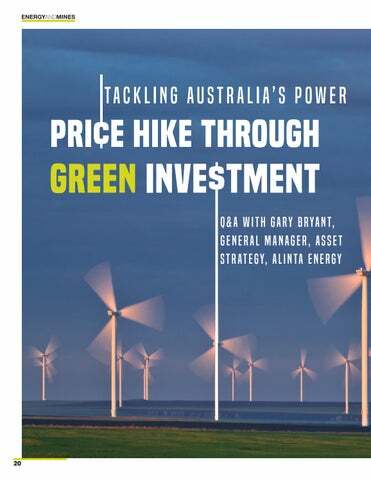 For utilities, the pressure is on to deliver low-cost solutions, and for Alinta Energy, it means investing in renewables and storage. â&#x20AC;&#x153;The focus for us is really on our customers and the energy challenges they are facing,â&#x20AC;? says Gary Bryant, General Manager, Asset Strategy at Alinta. Last year, the company purchased a 30 MW battery from Kokam to improve reliability and mitigate peak grid prices for mining customers in the Pilbara region. 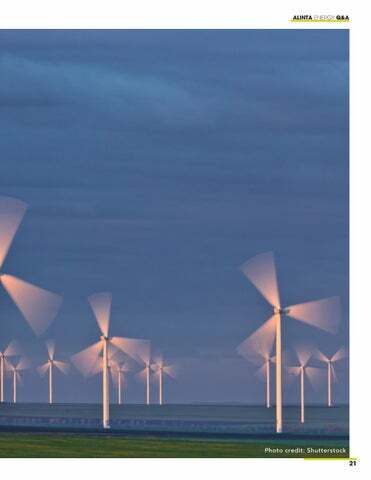 Since then, many other renewable projects have been green-lit. 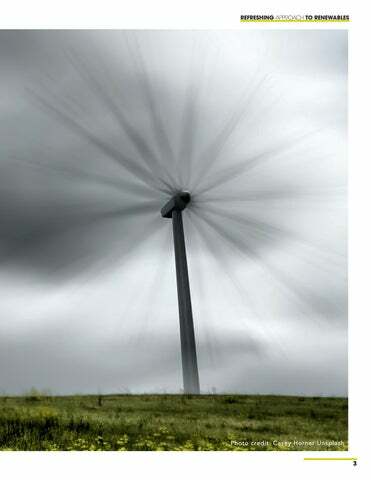 E&M: What makes Australia different from other markets in terms of renewable integration? GB: The biggest challenge in Australia has been policy uncertainty and differences between East and West government policy â&#x20AC;&#x201C; which has caused investment uncertainty for over a decade. Our business can support and work towards whatever the Australian community decides is an appropriate target for renewable energy. The most important thing is that this is done in an environment with stable policy, so longterm investment decisions can be made and we can deliver at the least cost solutions to customers and taxpayers. Given affordability is the key issue for our customers, low-cost renewables projects like the Yandin Wind Farm make sense. With growing momentum behind hydrogen technology and deployment in Australia and the mining sector uniquely positioned to benefit from these developments, Perth is the ideal destination for the inaugural Hydrogen and Mines event. Hydrogen and Mines will bring together senior mining leaders with key decisionmakers from all parts of the hydrogen value chain to explore opportunities and applications for mining. Along with critical insight on regulatory and technological updates, this event will address key questions for mines around the timescale, commercialization, economics, and real-world applications of hydrogen in mining. Vancouver-based Lion One Metals is partnering with Swiss clean energy firm, the meeco group, to construct a hybrid plant that they estimate will produce more than 10 GWh of solar power annually. In an interview for Energy and Mines Magazine, Lion One Metals Managing Director, Stephen Mann provides details of the project; the drivers, the potential benefits and progress to date. Despite the lack of carbon policy in Australia, the mining sector’s drive to integrate renewables into its power mix is refreshing proof that going green is now simply smart business. 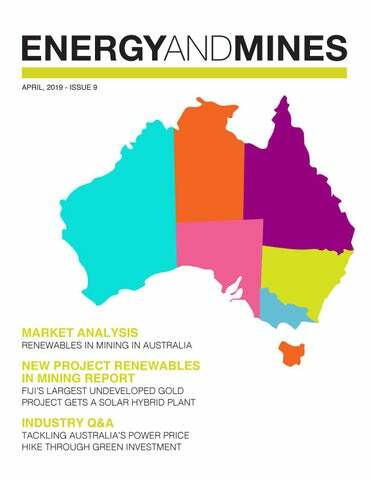 In a feature article in Issue 10 of Energy and Mines magazine Michel Melodie explores the increasing trend for Australian miners to explore renewables for mining (and soon, metals processing).